Since its inception in 1996, the real estate mutual fund has been managed by Gerard C. O’Reilly. This best fund has a yield of 3.26%. The recent yield was distributed on September 2012 ($0.17). The fund also has a low annual expense ratio of 0.24%. This is 82% lower than the average expense ratio of funds with similar holdings. 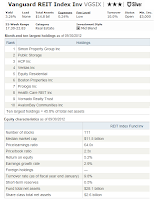 As of November 5, 2012, the annual portfolio turnover rate is also quite low (10.00%) compared to the category average (51.83%). The fund’s year to date (YTD) performance is 13.77%. It also has 5-year annualized return of 2.13%. The fund has returned 11.78% over the past 10-year and 14.57% over the past year. The equity fund has its best 1-year return in 2003 with 35.65%. VGSIX can be purchased from 91 brokerages such as Schwab Retail, JP Morgan, T Rowe Price, ETrade Financial, Ameriprise Brokerage, Firstrade, Vanguard NTF, etc. Please check with your mutual fund broker for details. To start investing in this best fund, you will need to a minimum initial investment of $3,000 for regular brokerage account or IRA account. This is a no load fund. If you are investing in Vanguard brokerage account, there is a $20 annual account service fee for each Vanguard fund with a balance less than $10,000. 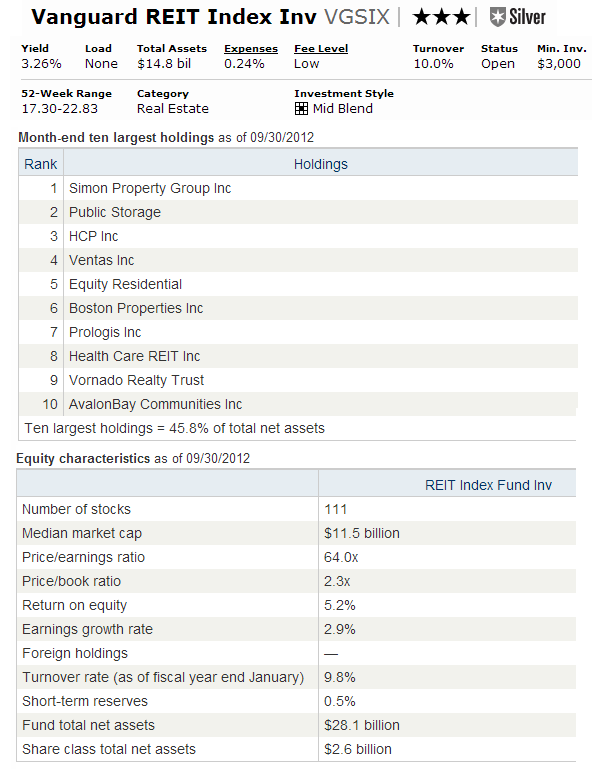 As of September 2012, the 10 largest holdings are Simon Property Group Inc, Public Storage, HCP Inc, Ventas Inc, Equity Residential, Boston Properties Inc, Prologis Inc, Health Care REIT Inc, Vornado Realty Trust and AvalonBay Communities Inc. They represent 45.8% of the total net assets. This fund has a total of 111 total stocks. According to the fund prospectus, the primary investment risks are Industry concentration risk, Stock market risk, Interest rate risk, Investment style risk, etc.